Happy Tuesday Everyone!I am not sure if I have mentioned this on here before but when it comes to baking, I can only make one thing and it only has three ingredients. So, when Easter dinner came around at the beginning of April, it was my job to bring the dessert. Instead of going to a store and buying something in plastic packaging and cheap ingredients, I remember that my friend, KP is an amazing baker and I would rather have a pie from her rather than anywhere else, any day! I asked her to also include the recipe she used for you all to enjoy yourself. This pie was looked amazing, it was delicious and there definitely wasn't any left over. Spring has definitely arrived here in Vancouver, and with summer just around the corner (sort of) I seem to have one thing, and one thing only on my mind - baking with lemons! Ahhh yes - it is that time of year when the sun comes out, the weather starts to get warmer and I start to experience intense cravings for the sweet and tangy delights of all things lemon infused! There is just something so fresh and crisp about lemon desserts that make for a perfect finish to those simple and light spring / summer meals, wouldn't you agree? Now for those of you who have never had a homemade lemon meringue pie, let me be the first to tell you that you have been seriously missing out on the deliciousness that is homemade meringue. How can I describe meringue.... homemade meringue is basically like eating soft marshmallowy amazingness, and when you get that golden brown toast on the top... game over. Quite simply, homemade meringue is dangerous and secretly, I usually make a little (a lot) of extra meringue, so that I can have a little (a lot) leftover for me to eat straight from the bowl... it is that addicting. In short - homemade meringue is the absolute best, but I will let you in on a little secret... it is actually super simple to make! This is a super decadent dessert and all things considered, it is actually very simple to make because there really is no special skills or equipment required. Even though Julia Child would have us believe that "every woman should own a blowtorch," for toasting such things as meringues, at this point in time my kitchen is unfortunately lacking in the blowtorch department. But never fear! We who are blowtorch-less can still toast our meringues! (One day I shall have my own blowtorch muaha! ... Although I'm not entirely sure that I should be trusted with such a flammable kitchen tool) So because of my lack of blow torch, I simply used my ovens broiler to toast the top of my meringue into that desired state of golden brown, toasted marshmallowy deliciousness and it worked perfectly! So now that I have you dreaming of this perfectly balanced, Luscious Lemon Meringue Pie, I think it's only fair that I shut up and share the recipe don't you? :) So here it is! I hope you enjoy! In a large mixing bowl, whisk together flour, icing sugar and salt. Using a pastry cutter, cut in the butter until pea sized chunks remain. Whisk together egg yolk, lemon juice and 1 tbsp of water. Drizzle over the dry ingredients and stir gently with a fork until ragged dough forms. Press a few chunks of the pastry together in your hands - if it holds together do not add any additional water, but if it crumbles apart add the additional water. Turn the dough out onto a lightly floured surface and bring together with your hands. Gently knead the pastry into the shape of a disk with your fingertips. Wrap the disk in plastic wrap and allow to refrigerate for at least 30 minutes. Tip: I like too prepare my pie dough the night before, so if your dough is in the fridge over night - simply remove it and allow it to stand at room temperature for 20-30 minutes before rolling. When you are ready to roll your pie dough, place the disk onto a lightly floured rolling surface. dust the top of the dough with flour and roll into a circle that is about 4-5 mm thick. Lightly press the dough into a 10 inch pie plate and fold the edges under to hide the rough edge. Flute the edge of the crust however you like. I simple used my thumb and forefinger to create this classic flute design. Use a fork to poke your pie dough around the edges of the pie and throughout the center. (This will help to ensure no air bubbles pop out of your dough. Place the pie plate and dough in the fridge and allow to chill for 20 minutes. Preheat your oven to 350 degrees and remove pie shell from fridge. lay a sheet of foil over top of the pie dough and fill with rice, beans or pie weights. Bake in the bottom third of your oven for 20 minutes. Remove the foil and the weights and bake for an additional 15-20 minutes or until your crust is lightly golden. You may need to protect the top edges of your crust with foil to ensure even browning throughout the crust. Remove from oven and allow to cool completely to room temperature before filling. In a medium saucepan over medium heat, whisk together eggs, egg yolks, sugar, lemon juice, lemon zest and salt. Whisk until pale and thickened. Remove from heat and pour through a fine sieve into a heat-proof glass bowl. Add cold cubed butter, one cube at a time, whisking until smooth after each addition. Place a piece of plastic wrap directly on the surface of the lemon curd and refrigerate for at least 6 hours or overnight. Bring a medium pot that is filled halfway with water to a boil. Whisk together your egg whites and sugar in a heatproof bowl. Place the bowl over the boiling pot of water being careful to ensure that the boiling water isn't touching the bottom of your bowl. Whisk over boiling water until the sugar is dissolved - about 4-5 minutes. To test whether the sugar is dissolved rub the mixture between your fingers - it should be smooth and not grainy. Remove egg whites from heat and whip with an electric mixer that has been fitted with the whipping attachment for 5-10 minutes or until stiff, glossy peaks form. Be careful not to over whip your egg whites, as this will cause your whites to break, and lose their beautiful smooth and glossy texture. You should be able to turn your bowl of meringue upside down and the meringue will stay in place in the bowl. Remove your lemon curd from the fridge and spoon into your cooked & cooled pie crust. Smooth the filling evenly in the pie crust with an offset spatula. Next, spoon the meringue on top of the lemon filling and use an offset spatula to create a fluffy design of your choice. 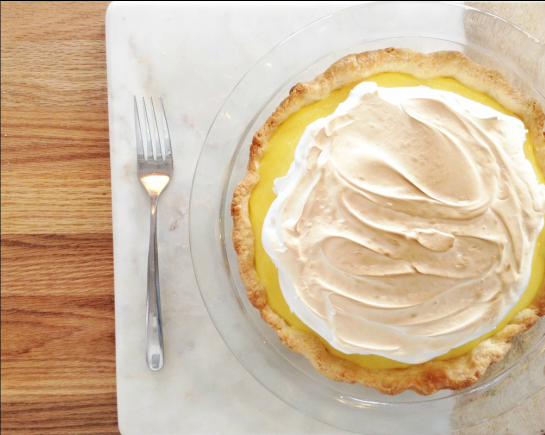 You can cover the whole pie with the meringue or you can leave some of the lemon filling visible as I did here. Turn your broiler onto medium-high and place the pie in the center rack to toast the meringue. This can take anywhere between 1-4 minutes depending on your broiler temperature, so keep a close eye on your meringue to make sure that you don't burn the top. Once you have toasted your meringue to your desired golden brown, remove your pie from the oven and allow to cool to room temperature before serving. ** Refrigerate your pie if it is going to be more than an hour or two before you serve it. Lemon Meringue Pie is a great make-ahead dessert option! Simply prepare your pie dough and lemon curd the night before your event. Bake the crust late in the morning so it has some time to cool completely. Prepare your meringue a couple hours before your event, and then all you have left to do is fill your pie, top it with the meringue and give it a quick toast in the oven. It makes for a very simple yet super elegant and delicious dessert that will definitely impress your guests! There we have it! 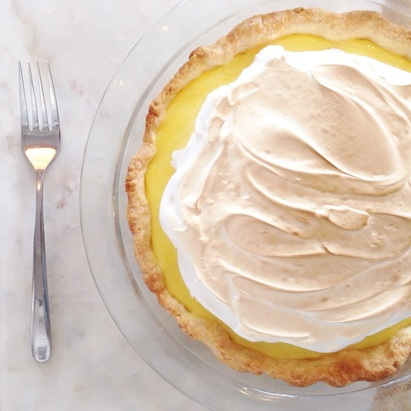 My recipe for homemade Lemon Meringue Pie! Needless to say the pie turned out beautifully! I mean it was almost too pretty to eat.... well almost too pretty to eat ... :D Seriously, I could just make a picture of this pie my screen saver for the rest of time - although I think that could be considered a work place hazard because it would most likely induce uncontrollable pie cravings all day long. Yeah... on second thought, for now I think I will stick with my landscape pictures.